Apply 1 quart of product to 5,000 sq ft to kill: Aphids, beetles, chinch bugs, crickets, flies, ladybugs, leafhoppers, mealybugs, milkweed bugs, mosquitoes and ticks. Apply 1 quart of product to 2,500 sq ft to kill: Ants, armyworms, cockroaches, cutworms, palmetto bugs and sod webworms. Determine the size of the spraying job. For lawns, measure the area to be sprayed. 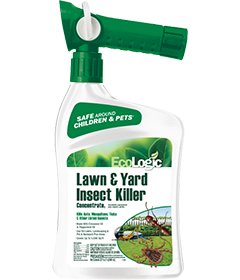 Apply 1 quart (32 fl oz) per 2,500 sq ft or 5,000 sq ft depending on insects present. See list above. Begin treating when insects first appear. Applications should be repeated only as directed to maintain control. Remember, thorough coverage is important. OUTDOOR USE: Before using product, remove debris and leaf litter from next to the foundation, cut back vegetation and branches that touch foundation and move or rake back rocks, deep mulch or other potential pest harborage next to foundation. Spray infested areas thoroughly. For ants, thoroughly wet hills and runways. Do not overapply to ornamental plants and shrubs as damage to foliage may result. Shake container well before using. Connect a garden hose to the sprayer nozzle. Make sure switch is fully forward in the “OFF” position. Turn on water at faucet. Extend hose to the farthest area to be treated and work back toward the faucet so you don’t come in contact with the treated area. Remove safety tab from sprayer’s right side by pulling straight out. Keep for future reuse. To BEGIN spraying, point nozzle toward treatment site and pull switch backwards with thumb toward hose connection. Water will automatically mix with the product. Spray until wet to control weeds. Walk at a steady pace, working back toward the faucet while spraying using an even sweeping motion, slightly overlapping treated areas. To STOP spraying, push switch forward with thumb toward nozzle. Turn water off at faucet. To relieve pressure before removing nozzle from hose, pull switch backwards with thumb toward hose connection until water stops spraying. To STORE unused product, make sure switch is fully forward in the “OFF” position. Reinstall safety tab into sprayer’s right side. With sprayer in the full “OFF” position, push tab into position. Place in a cool area away from heat, sunlight or open flame. NOTE: This product is non-staining to most outdoor surfaces depending on age and cleanliness. However, before using in areas where the spray may contact outdoor surfaces (vinyl siding in particular), test in an inconspicuous area and recheck in a few hours. Do not use if any staining is observed. Have the product container with you when calling a Poison Control Center or doctor, or going for treatment. You may also contact 1-800-923-3623 for emergency medical treatment information. Storage: Store in original container in a cool, dry area inaccessible to children and pets. Protect from heat and freezing. Store between 40°F and 90°F. Keep container closed tightly to prevent evaporation. If spillage occurs, dilute with water and flush away. Container Disposal: If empty: Nonrefillable container. Do not reuse or refill this container. Place in trash or offer for recycling if available. If partly filled: Call your solid waste agency for disposal instructions. Never place unused product down any indoor or outdoor drain.